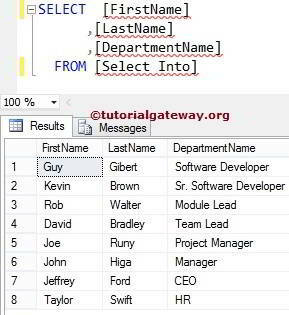 The SQL SELECT INTO statement can be used to insert the data into tables. The SELECT INTO in SQL first creates a new table and then it will insert the selected rows by the SELECT Statement into that new table. 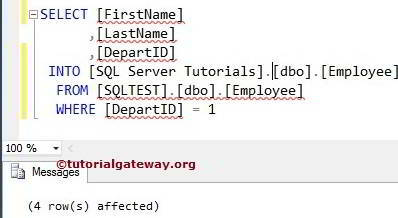 TIP: If we haven’t created the destination table then Sql Server Select Into statement can be very useful to insert the data into the destination table. If you have an existing table then use INSERT INTO SELECT Statement. Columns: It allows us to choose the number of columns from the tables. It may be One or more. Source: One or more tables present in the Database. Use JOINS to join multiple tables. 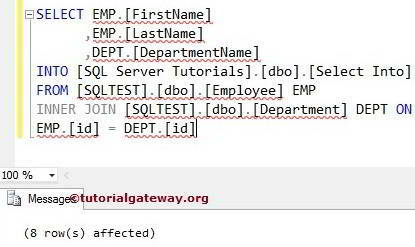 In this article, we will show you, How to write a SELECT INTO in SQL Server. From the below screenshot you can observe that We don’t have any Department or Employee table in the [SQL Server Tutorials]. 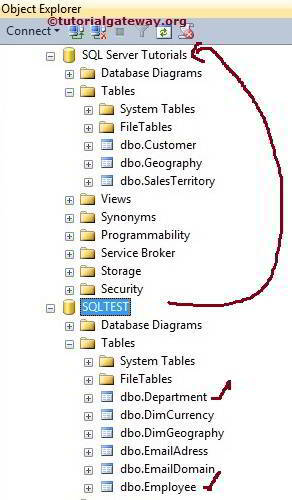 Here, Our task is to Select the Data present that tables in the [SQLTEST] database and insert into [SQL Server Tutorials] Database using SQL SELECT INTO Statement. 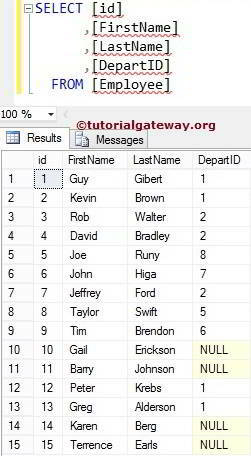 In this Sql Server Select Into statement example, We are going to select all the Columns present in the Department table and insert them into [SQL Server Tutorials] Database. OR We can use the asterisk (*) as well. But it is not good practice to use asterisk so always provide the column names. 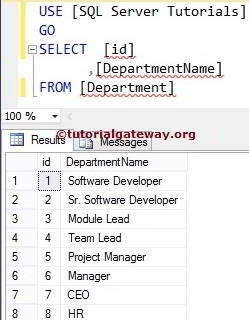 Above T-SQL query will create a new table called [Department] in the [SQL Server Tutorials] Database and insert all the records from the source data. In this Sql Server Select Into example, We are going to select a few Columns present in the Employee table and insert them into [SQL Server Tutorials] Database. Here we are going to restrict the rows as well using the WHERE Clause. 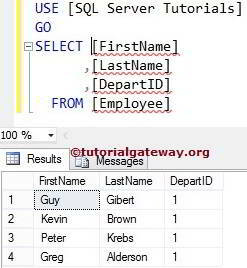 Above T-SQL query creates a new table called [Employee] in the [SQL Server Tutorials] Database and insert [FirstName], [LastName] and [DepartID] columns from the source data where [DepartID] value is equal to 1. 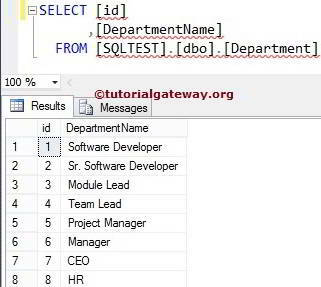 In this SQL Select Into example, We are going to select Columns present in both the Employee table and Department table then, insert them into [SQL Server Tutorials] Database. Here we are using the INNER JOIN for joining the two tables using id column.